This helps everyone to see the full range of possible reform approaches, without having to review all possible reforms. Strategy-making becomes a discussion about which of the reform approaches to use in which context and how the context affects which sort of reform to prioritise. For example, the initiative called I-paid-a-bribe had a significant beneficial impact in India, but it made no headway at all in China. This focus on a range of approaches also gets us away from the natural bias of each individual profession for their own reform approach (Lawyers on improvements to the law and the rule of law; aid agency professionals on system and process reforms; civil society activists on monitoring and oversight reforms).This repertoire of possible reform approaches is common across all sectors. Most institutions, processes and systems have numerous weaknesses, relating usually to poor efficiency and effectiveness. Sometimes these processes may have actually been designed to enable corruption. But, more commonly, they are simply weak processes, or overly complex processes, that are corruptly exploited. This is the reform area that tends to get the most attention, fixing the technical problems. Improving the professional processes, for example, such as teacher training in the education sector, treatment protocols in the health sector, patients having to pay for minor treatment that should be free, or evidence tampering rules in policing, is a vital part of institutional improvement. This makes sense, especially when it involves systematising something that previously involved many human-to-human interactions. However, an exclusive attention to technical measures only is a high-risk strategy – technical solutions often fail, they can be slow and are sometimes deliberately slowed down, and sometimes they are used as an impressive-sounding excuse for what the leadership knows will be little real change. And, at the analysis stage, you may also find that reform areas which seem easy often involve complex social interactions and require multiple stakeholders to make changes: a narrow scope is usually better than a broad scope. So, do not be too carried away by expectations that functional reforms alone will solve your corruption problems. Often the reforms will encounter the same problems – such as complex social habits and relationships of long-standing – that the previous inefficient processes also fell prey to. Do use functional reforms, but use them in combination with other approaches, and with sufficient prior analysis. 1.2 Improve Public Financial Management (PFM). Making treasury operations clearer and more controlled; making budgets transparent, making spending against budgets transparent; improving all the processes around money reduce corruption substantially. In general, strengthening Public Financial Management is probably the single most effective anti-corruption measure available to public officials (See Johnsøn et al (2012) for the evidence). 1.3 Improve financial management processes. Improving PFM is a pretty high-level activity. There are hundreds of more modest reforms to improve the integrity and transparency of basic financial management processes that will also make corruption harder. Proper budgeting process, making the annual budget public, tracking the spending against those budgets, etc. These small changes can be powerful. 1.4 Improve the Management Information Systems (MIS). Improving the organisation’s management information system is core to better institutional control of corruption. It is astonishing how many government entities have terrible MIS, preventing effective management and enabling extensive corruption. MIS reform is not a ‘citizen-facing reform, but it has been shown to be effective in constraining corruption in many cases. Best if this can be done by small projects, as the success rate of large-scale IT reform is very poor. Sometimes, a simple parallel system is the best, quickest and most motivating way forward, if the problems are acute. A technical analysis of options is needed: in such cases, demand from the consultants that several of the options be of small scale, and that each option has to show explicitly how it could reduce corruption. 1.6 Consider how new technology might help or might enable the problem to be re-defined. There are many more opportunities today to reduce corruption by the introduction of new technologies than ever before. Well-known examples are Apps on mobile phones and e-procurement. Always scan your equivalent sector in other countries to see how they are using these. Youngsters and new recruits will be better at this than older staff! 1.7 Look to mainstream your functional reforms within the broader Ministry reform efforts. It is a mistake to treat anti-corruption as a stand-alone effort. More progress will be made by introducing anti-corruption efforts within the mainstream sector reform programmes. Never doubt that a small group of thoughtful, committed citizens can change the world; indeed, it’s the only thing that ever has. The truth of this famous quote, by the American anthropologist Margaret Mead, is confirmed in the anti-corruption sphere by recent research. The most recent ANTICORRP research investigating success against corruption identifies that all the successful country cases involve ‘human agency’ to a major degree. They were all effected by committed groups of people, sometimes public officials, sometimes politicians, sometimes civil society actors, often a combination of all three. Furthermore, the country successes were all achieved by the country’s own human agency efforts rather than by the efforts of outsiders (Mungiu-Pippidi and Johnston 2017 Transitions to good governance),in countries as diverse as Botswana, Georgia, South Korea and Taiwan. Another analysis, on how good governance evolved in Oman, identified the importance of a well-educated group of Omani citizens, who had been recently violently expelled from the island of Zanzibar. These citizens had skills that allowed them to administer core technical functions within a nascent state bureaucracy. This group was not at the centre of political or economic power hierarchies, but was dominant at the middle and upper-middle level positions of the bureaucracy (Hunt and Phillips 2017). So, one of the most important steps you can take is to supplement your own commitment by aligning with – or helping to develop – other committed people and groups. This might be as simple as building up a team of committed people around you in your area of responsibility. Or it could be on a larger scale, collaborating with groups in the private sector or professional associations, such as doctors or engineers. Or it could be working with civil society or in collaboration with relevant international initiatives. 2.1 Build your initiative around the people that live around the affected area or are involved in the relevant sector. Government anti-corruption initiatives that are developed together with the affected communities can expect a better success rate than those devised by a small group within government. Not only do you get more ownership of the plans that way, you also prepare the ground for community oversight. 2.2 Build a critical mass of committed supporters inside your Ministry or organisation. Most people in most organisations hate corruption but feel trapped and disempowered by it. Being clear that your team can and will make a difference can change the organisation’s culture to one with a much lower tolerance of misbehaviour. It can inspire people to work with you and to put in much more than ‘normal’ effort. If you are in a leadership position, then your potential to influence others and to reach a wide audience is large. There is a deeper rationale at work here. In general, corruption is a subject that is actively not discussed among professional groups. There is the fear that you might be showing yourself to be naïve, or that you will show yourself not to care about the topic, or that your colleagues may be involved, or that you may be outcast for raising such a sensitive topic. So, do take this ‘building commitment’ stage seriously. Ask someone to open up these discussions across the organisation. This author has been present at such discussions in numerous professional leadership groups, from global companies to health leadership teams, from clean Scandinavian countries to conflict countries. Each of them was initially reluctant to engage in open discussion about corruption. This changes quickly once you make it clear that this is not a taboo subject, and that your purpose in tackling it is not punitive but is constructive because it will actively improve access and service for your patients. You can do this in round table conversations. 2.3 Set up one or more forums where people can discuss tackling the corruption issues and demonstrate their commitment to your plans. Sometimes people – public officials, citizens, whoever – are ready to help but don’t have a forum around which to congregate. Such forums also show participants from across the organisation or across government that they are not alone with their corruption problems. It is easy to set up informal or advisory discussions forums, and you can advance from there. In some societies, relevant forums already exist, such as education or health shuras in Islamic countries, or think tanks within professional sectors, such as the International Bar Association’s anti-corruption working group. It’s easy to organise your own. 2.4 Bring civic groups on board and collaborate with civil society organisations. It has become much more common in the last 20 years for government officials to engage professionally with NGOs, even in sensitive areas like police and national security. There is more acceptance of enlisting citizens for change, as well as responding to citizens who are determined to achieve change. Engaging with external groups can feel risky if it is not currently common in your country/organisation, but their commitment can make a major difference in building support and credibility for the changes you want to bring about. 2.5 Bring in experts in trans-national initiatives specific to this sector/corruption problem. There is a trend now in anti-corruption for centres of anti-corruption expertise to be developing sector-by-sector. For example, there is one in education, in health, in defence, in police, and in shipping. Several are very good, and they can be used to influence and improve national norms. You can find details of each of them in the relevant sector review. Just call them. 2.6 Bring in enthusiasts from the private sector. Today, many companies are actively looking for ways to improve their image and reputation by working with government to reduce corruption. This is true both nationally and internationally. They may be doing it for bad reasons – wanting to make themselves look good without doing anything much – but there is now a lot of experience of good examples, which you will find in the sector reviews. There are lots of opportunities to use them to benefit government. The easiest way to initiate this is to reach out to the industry association relevant to your sector (e.g. Chemical Industries Association, Medical Devices Association, National Chamber of Commerce, etc.). Similarly, the companies of the G20 countries have a formal anti-corruption group, called the B20 anti-corruption group, which is actively supporting aarti-corruption initiatives, such as open registries of the beneficial ownership of companies. You can invite companies in your sector and in your country to meet with you and collaborate with you on your initiative. 2.7 Actively search out possible coalitions. For each corruption issue, ask yourself what combination of people and/or organisations need to come together to solve the issue? Because corruption is always a cross-organisation issue, this will be one of your default questions. Which government agencies are involved? At what level? Which companies or industries? Which local authorities? Bring them together for the first time and you will find more dimensions to the corruption issue than you were previously aware of; but more ideas on how small different measures from different groups can lead to its solution. 2.8 Enlist the international development community to help with this problem. In countries where funding is provided by partners from other nations, the international partners have considerable power that you may be able to leverage against corruption. Contact the relevant people in the local office of the development agency, or the local embassy. Monitoring and scrutiny are central elements in curbing corruption. Monitoring by official, permanent parts of the government system – such as internal auditors, external auditors and regulatory agencies – may not be in place or, more commonly, are in place but are ineffective, for diverse reasons such as lack of budget, institutional neglect or deliberate marginalisation. Much faith is therefore placed in external bodies, such as independent agencies and NGOs, but these bodies too often perform poorly, or are subverted in the political environment through being under-resourced, or denied access to key people and records, bribed or threatened, and otherwise marginalised This is an area with much scope for experimentation, such as trying out hybrid organisations of government people plus outsiders, or unusual mandates, or new forms of citizen oversight/participation through the opportunities afforded by mobile phones and social media. Finding ways to get multiple forms of independent scrutiny into action is therefore a core part of anti-corruption strategies. Operational management control. The managers are responsible for the day-to-day controls on all the processes within an organisation (public or private sector): both their own management controls (checking!) and procedural internal controls. Risk management control, compliance controls and overall financial controls. These are supervised outside of the line of management. 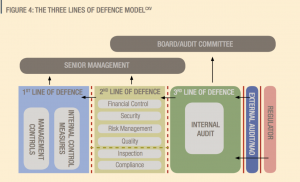 The diagram opposite from the Institute of Internal Audit shows this pictorially. 3.2 Demand more from your internal audit function. It is common across governments worldwide to find under-resourced and marginalised internal audit departments. This may be due to cost cutting, but can also be deliberate, in that it removes one of the semi-independent sources of scrutiny. Strengthen it, and/or show publicly that you are investing them with much greater authority. For example, the audit department in the Ukraine Defence Ministry led the anti-corruption drive of that Ministry and has been public in publishing its audit result (Barynina and Pyman 2012). Conversely, in endemic corruption environments, the internal audit department can become an epicentre of corruption, precisely because they have this semi-independent function and are hard to remove. In such circumstances, you need to restructure the department, and most likely bring in new people. 3.3 Commission some focused audits and reviews. Internal audits are not usually focused on corruption, but focused audits, regular intrusive review and/or active follow up of corruption risks can make problems visible. They also signal a change in the culture and show that certain areas of the system are being targeted. There are lots of examples in different sectors where such reviews have been a catalyst for change. 3.4 Demand more from the external auditors. 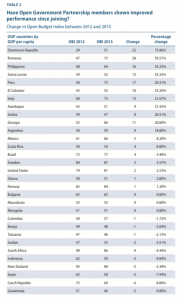 Look at how effective external audit is in pointing out corruption problems in your country. Sometimes the national supreme audit body is excellent; more often it is slow and ineffective, and can itself become a vehicle for extortion, threatening organisations with a high penalty unless bribes are paid. Decide whether your Supreme Audit Office can be used constructively, or shamed into action, or is just too much effort. In more economically developed countries, external commercial audit is usually reasonably effective, though it suffers from the oligopoly that controls the audit profession. In some countries, the external commercial auditors can also be part of the corruption problem. 3.5 Consider pressing for a formal Commission of Inquiry. Sometimes it makes sense to establish a Commission of inquiry about the corruption, as a way to publicly address known but unexplored problems. For example, this has been the most common way to publicise and address corruption in police forces around the world and has been common in health corruption. This is a way of raising awareness of the corruption issues in a very visible public forum. A detailed analysis of the rationale and potential benefits of choosing such a reform measure in a country like Uganda has been made by Kirya (2011) in ‘Performing good governance: Commissions of Inquiry and the Fight against Corruption in Uganda’. Here is her overview: ‘The findings suggest that the global anti-corruption framework signified by the good governance agenda is hindered by various factors such as the self-interest of donors, the moral hazard inherent in aid and the illegitimacy of conditionality; all of which contribute to the weak enforcement of governance-related conditionalities. This in turn causes aid-recipient countries such as Uganda to do only the minimum necessary to keep up appearances in implementing governance reforms. National anti-corruption is further hindered by the government tendency to undermine anti-corruption by selective or non-enforcement of the law, the rationale being to insulate the patronage networks that form the basis of its political support from being dismantled by the prosecution of key patrons involved in corruption. Ad hoc commissions of inquiry chaired by judges, which facilitate a highly publicised inquisitorial truth-finding process, therefore emerge as the ideal way of tackling corruption because they facilitate ―a trial in which no-one is sent to jail. …They also served to appease a public that was appalled by the various corruption scandals perpetrated by a regime that had claimed to introduce ―a fundamental change and not a mere change of guard in Ugandan politics. Nevertheless, while they enabled the regime to consolidate power by appeasing donors and the public, they also constituted significant democratic moments in Ugandan history by allowing the public – acting through judges and the media – to participate in holding their leaders accountable for their actions in a manner hitherto unseen in a country whose history had been characterised by dictatorial rule. 3.6 Set up monitoring by citizen groups and NGOs. Some countries, especially in Latin America, have a very active tradition of citizen engagement, and they are likely to be already active on anti-corruption scrutiny. In other countries, you may need to encourage them, or find ways to support them. It also helps to seek to build up a conversation across the whole of civil society, so that they collectively understand your intent. 3.7 Citizen Report Cards. Report cards are a specific citizen-driven method used to generate information on the quality and efficiency of the public service as perceived by users. There are many examples of their use in many countries. See for example UNICEF (2016) Citizen report card manual, or Water and Sanitation Project Karachi (2010), or Global Witness (2010) Making the forest sector transparent: how do report cards help? 3.8 Strengthen the regulators and the relevant professional agencies. There is usually a wide variety of regulators and nominally independent agencies involved in governance, for example examination boards in the education sector, or police complaints commissions in policing. Such independent agencies may be effective, but usually need boosting. Sometimes a professional elite gains control of them, and such monopoly control can easily veer towards corruption. 3.9 Actively exploit the international peer review mechanisms. The international community has set up peer review mechanisms through UNCAC (See UNODC 2015 Five years of UNCAC: What have we learned), through OECD, and through GRECO for EU countries (See GRECO 2017 Anti-corruption trends, challenges and good practices in Europe and the USA). Usually these are narrow in scope, and proceed in a slow, bureaucratic fashion out of the public eye. Consider pressing these organisations harder, for example to do a really energetic review. Encourage them to be honest and publish the results. 3.10 Actively exploit sectoral country-comparison mechanisms and indexes. There is a new trend to develop anti-corruption comparisons within individual sectors, and some of these have detailed methodologies for comparing the sectors across countries. See this site from Transparency International Defence & Security, for example, where they compare defence corruption vulnerabilities in great detail across 130 countries. This can be an effective way of monitoring your national sector, by comparing it with their peer organisations in other countries. Encourage their use in your country. Whistleblowing is now recognised as an important mechanism to support integrity in organisations. However, in reality these mechanisms are usually weak, or may exist on paper only, and the whistleblowers usually end up suffering. Yet they are vital in identifying and calling out corruption: the challenge is to find a way in your context to make them effective, and to publicise this. Examples include Australia, Ireland, South Africa, South Korea, UK and the USA. It is increasingly common for countries to implement new whistleblowing laws/systems, and some of the new ones are being energetically implemented, such as in Italy, Slovakia, Saudi Arabia and Tunisia. The EU has recently published a draft directive on whistleblowing (what’s a good reference for a lay reader?). There is plenty of guidance available on what constitutes a good law, and you can use this information to critique your own laws (See, for example, Worth 2018a, 2018b; and the Centre he leads from Berlin, the European Centre of Whistleblowing Rights. You can also read the UNODC guideto good practice in whistleblowing. Example. The Netherlands has a ‘House of Whistleblowers’ within the government since 2016 for complaints by both employees and non-employees. See, for example, Denklaw 2016, though it has experienced some problems. An increasing number of companies have also set up whistleblowing/complaints systems that are seen to be working well. See companies such as Lockheed Martin (USA) and Maersk (Denmark). Example. There is a major research programme in Australia, called ‘Whistling while they work’, which is identifying ways of improving managerial responses to whistleblowing in both private sector and public organisations. Their website is here. The usual reality: For most people in most sectors, the reality is that the government-wide system is poor and/or mistrusted and is anyway outside of their control. So, what can you do that will be helpful to your situation? Where people feel able to complain and something gets done? Even though it will not be called ‘whistleblowing’ it may be fulfilling the same sort of function. For example, in education, you may have a structure of parents’ committees in each school and/or region, who are able to raise complaints. In health you may have a similar structure of patients’ committees or community groups around a hospital. Or it could be that you have a good audit department, which staff feel able to contact. Look across your organisation for such starting points. Consider strengthening them – it is common for such groups to be underfunded and regarded as marginal to the good functioning of the ministry. That can change, and such groups can become a priceless resource that gives honest, useful feedback on what is not working. There are now some civil society organisations that are set up specifically to act as independent ways for people to complain. For example, Transparency International-Ireland supports reporting in the public, private and not-for-profit sectors. See their ‘Integrity at Work’initiative. Example: ‘Platform to Protect whistleblowers in Africa’ accepts encrypted complaints from people in French or English across African nations. You might be able to explore working with such an organisation. See PPLAAF. Ask around if such organisations exist in your country. You may have concerns because you do not control such civil society organisations, but that is exactly why they are credible, so it is worth exploring this possibility if such entities exist in your country. If you are in a position to improve your national system there is extensive guidance available from UNODC with this report: Resource guide on good practice in the protection of reporting persons, UNODC 2015. Find the report here. Routine prosecution of corruption cases is one of the hallmarks of a state that has control of corruption, and some experts describe routine prosecution as the definition of success against corruption: ‘Reducing corruption to the status of exception in a sustainable way thus defines a successful evolution’ (Mungiu-Pippidi and Johnston 2017 p9). However, prosecutions are high risk: they can be very slow, often many years, to come to court; they can be unpredictable, as powerful individuals find ways to escape prosecution or conviction. Worse, in countries where the judiciary are corrupt, this tends to mean that corruption reform will take decades (World Bank Development Report 2011, p109). Perhaps only Sicily, in Italy, has had success against corruption by a prosecution-led strategy. Whilst prosecution may be a tactical response to public pressure, it is unlikely to be a major part of the strategy. 4.1 Exert pressure via discipline, sanctions and penalties. Civil and administrative penalties sometimes hold out more hope of impact than prosecution. It is well worthwhile examining in detail what disciplining and sanctioning options you have, whether they are being used to the maximum extent, how they might be strengthened, and how they can be adapted to prioritise corruption cases. The priority may be to move a corrupt person from their job – to allow that directorate to improve – and to sanction the individual so that s/he is not simply placed somewhere else in the bureaucracy. 4.2 Calling out corruption. Do not underestimate the effect that you and senior colleagues can have just by speaking openly and publicly about the corruption problems. The most famous example is probably when the head of the World Bank, James Wolfensohn, spoke about corruption in 1996, after decades of silence, the effect was huge. Countries such as Georgia and Estonia have had great success not only through real anti-corruption measures, but also by making it totally, publicly clear that curbing corruption was the top mission of the government. It was clear that the government would stand or fall by their success in tackling corruption, and this gave them greater credibility with the public. Colombia has recently been following a similar path. If you or your colleagues are in a position to speak openly of the corruption and the suspected corrupt individuals, naming and shaming can change the dynamics. As the Icelandic and Norwegian Prime Ministers both said recently at an OECD Integrity Forum in March 2018: ‘Naming and shaming is good. Iceland had suffered a gradual erosion of trust in the Icelandic elite, which led to the economic crash of 2008, and they are determined not to see the same problem recurring again. Sometimes, everybody knows that what is going on is corrupt, but no one dares to be the first to say so: speaking out or putting a senior individual under investigation can be dangerous, but it can also change the culture. Sometimes you can change the dynamics of large organisations if you make it clear that sanctions or disciplinary action will definitely be taken. 4.3 Investigation and prosecution. Mainstream work on improving the judicial process is important but has not been followed up here as being outside the scope of this sector-based approach. Other approaches have been to create specific centres of expertise within the judiciary to manage corruption cases, such as a corruption court, as is the case with the Anti-Corruption Justice Centre (ACJC) in Afghanistan and the International Commission against Impunity in Guatemala (CICIG), who have developed another interesting approach with a parallel investigations mechanism, despite intense opposition. 4.4 Carry out a legal and constitutional review. In the 1990s, calling for new laws or new regulations against corruption was the first port of call for reformers. Now most countries have decent laws relating to corruption and the other relevant subjects: access to information, whistleblowing and conflict of interest. Nonetheless, there will still be multiple areas where reform of law is vital and where gaps, overlaps and ambiguities allow the corrupt to escape justice. Such reviews, when done by commercial law firms, tend not to be public, but you can find reviews by international bodies like OECD, UNODC, law think tanks and civil society organisations. Within sectors – health, education, telecoms, etc. – there are also always weaknesses in primary laws, secondary regulation and local regulation. There will also be new forms of corruption, some of which may start of being legal, and new ways in which the corrupt are bending the current laws in their favour, which too will need regulation. You will have many suggestions from officials on how the laws can be improved. This needs critical review, however. It is normally unwise to plan on making a large number of regulatory changes, as you are likely to get bogged down and thereby seen to be making no progress, so the changes that you will pursue need to be carefully prioritised for effectiveness. Involve outsiders in the review, not just Justice officials: civil society, or non-government legal experts as well with knowledge of anti-corruption impacts. 4.5 Encourage broad reviews by academics. In difficult environments, where there is no encouragement for open analysis, an alternative can be to encourage researchers to do such analyses. They may be able to build the foundations of a proper understanding of where the weaknesses are and how they can be better addressed. See, for example, this review of the corruption and anti-corruption environment in Iran (Bennett and Pyman 2018). Researchers recently examined data on police-related bribery in South Africa. In one province, Limpopo, bribery reduced by almost 15% between 2011 and 2015, while the rate in the rest of the country reduced by on average less than 4% (Peiffer et al 2018). This bribery reduction in Limpopo’s police took place during the time that the national government led an unprecedented high-level anticorruption intervention in several provinces, but a specific intervention in Limpopo, unrelated to the police, affected bribery levels dramatically and quite quickly. The research suggests the police in Limpopo may have been especially reluctant to engage in bribery then because of uncertainty as to whether they were also under investigation and because of the heightened anticorruption action. The bribery reduction in the police was likely an unanticipated ‘benign side effect’ of a separate intervention. This case shows that certain types of disruption may reduce bribery patterns, but only for a relatively short time. For longer- term impact, disruption strategies likely need to be continuously inventive and re-inventive, and/or to be driven by strong leadership that can and will continually disrupt corruption patterns. The example teaches a wider lesson: a disruptive event can counteract sector-specific factors that likely enable entrenched patterns of corruption, and this can happen more quickly than expected. 4.6 Search out policy capture cases. It is just a fact of life that those with power or access to power will seek to influence the law and official policy for their own benefit, and that in many cases they will succeed. Be alert for this in each corruption issue you are taking on. The OECD (2017) has produced a useful report on addressing policy capture. Though they don’t have any magic solution on how to prevent it (the diagram opposite shows their overall approach), the report is good and may be helpful to you in arguing for change. 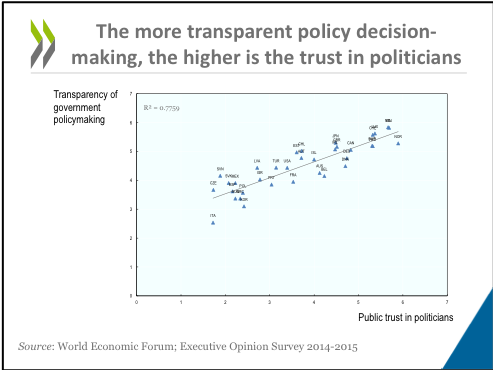 For example, they provide clear evidence that increased transparency of policy making is connected with increased trust in politicians – see second diagram below. 4.7 Consider what changes in policy, even small ones, might change the corrupt dynamics. It has not been usual for policy to be made explicitly with anti-corruption in mind. This may therefore mean that there are some policy changes that you can make that would have a significant impact. Equally, the new science of changing behaviour shows many different ways in which small changes can have a big impact in changing behaviour. The best recent report on this in relation to corruption is from OECD 2018. Along with independent review and monitoring, transparency is one of the important tools in reducing corruption. Corruption problems naturally thrive when the relevant data is not going to be made public. This reform approach has now advanced to the status of there being an international collaboration, the Open Government Partnership (OGP). OGP was launched in 2011 to provide an international platform for domestic reformers committed to making their governments more open, accountable, and responsive to citizens. It now has about 100 countries as members. As the table opposite shows, some of them had made significant progress between 2012 and 2015 (as measured by the Open Budget Index), whilst the rest have made little progress so far. However, though transparency is a valuable tool, it also has its limits and counterproductive implications. It has been easy for many countries and sectors to seem to comply, putting a lot of data online, whilst in reality continuing to obstruct. So much so that some people now refer to ‘transparency theatre’. The OGP initiative points out how much of the information that is put into the public domain by governments and official bodies is not actually usable because of the way it is presented, formatted etc. So, there is more to this than just transparency, or open data, alone. (If you want to read a detailed analysis of the limitations of transparency, see Alloa and Thoma (2018)). 5.2 Require that engagements with public officials & public bodies be public. If public money is being used, then there should be a presumption that the interactions should be public. Examples include senior public officials having their engagements calendar online (European Commissioners), or new contracting and procurement that require all contracts, progress reports, tender submissions and so forth to be available online (see Open Contracting Partnership for example). 5.3 Require that national, regional and project budgets, and the spending against those budgets, are transparent. This is not yet the case in many countries. You can use the Open Budget Survey (OBS) to identify which countries are good and not good on budget transparency. 5.4 Consider making all internal and external audit reports public. External audit reports certainly ought to be always public, though many are not. Internal audit reports are more commonly not public. There is some justification for this – it can lead to big problems being muzzled rather than reported – but the opposite problem is usually bigger: if the report is not public, it can be buried, and marginalised. 5.5 Watch out for when transparency does not work as intended. Transparency may be good, but it is not a panacea. Often data and reports are made transparent, but the underlying corrupt behaviour still does not change, especially if the public and NGOs are uninterested in examining and acting on the data. Look especially where you already have transparency and it is not having much effect: what more do you need to do? For example, the answer is often to encourage civil society to make more use of the newly transparent information. Many countries in Latin America already have extensive transparency of government data, but the volume has vastly exceeded the capability of civil society to review it. Brazil is one such example. See Power and Taylor (2011) and Aranha (2018). For data already officially public, is it presented in a useful, usable form? Approach each data-set critically: do not just accept that ‘it is public’ as sufficient. ‘Traditional approaches based on the creation of more rules, stricter compliance and tougher enforcement have been of limited effectiveness. A strategic and sustainable response to corruption is public integrity. Integrity is one of the key pillars of political, economic and social structures and thus essential to the economic and social well-being and prosperity of individuals and societies as a whole’ (OECD 2018 Behavioural insights for public integrity: harnessing the human factor to counter corruption). Integrity is a magical word. Coming from Latin (integritas) and then French (integrité) in the Middle Ages, its meaning combines good moral character of the individual and wholeness of a larger entity in one single word. The Oxford Dictionary definition gives this in full. Strengthening integrity is a positive emotion and one that strikes a strong chord of pride in people. However, note that ‘integrity’ does not always translate well. For example, there is no equivalent word for integrity in Slavic languages. Some countries and sectors naturally focus on ‘building integrity’ as a base for building a more trusting and less corrupt society. Rwanda is one such country (See Heywood et al 2017), and the Military is one such sector. For examples, see the Defence Integrity Framework of the Canadian military approach, or a critical analysis of the decline of US army integrity in Wong and Gerras 2015, or NATO’s initiative Building Integrity and the NATO publication ‘Building integrity and reducing corruption in defence’, available in multiple languages. Integrity approaches in government are seen to have developed from the Scandinavian civil service and the UK Civil Service in the 19thcentury, as they moved towards meritocracy-based recruitment and developed norms of professional service. See for example Mungiu-Pippidi (2015) or Johnston (2008). Since then, most national public servants receive training and guidance in good ethical behaviour, and Colleges of Government teach the values. In similar vein, companies have developed their management systems to control corruption and comply with anti-corruption laws, many of them have simultaneously embraced a values approach with their workforce. They too recognise that compliance-only approaches are limited and insufficient. There is plenty of guidance on developing programmes on both compliance and ethics approaches in companies, and how to develop the two in tandem. More generally than any of the above, the norms of most societies and of all religions include acting with integrity; religious leaders and their institutions, of whatever faith, exert the principal force in promoting and maintaining good personal conduct in many countries. You can find informative articles discussing integrity as a mechanism for tackling corruption. See, for example, Heywood et al (2017), Pyman and Wegener (2010), or Lamboo et al (2016). Below is OECD’s model of the three ‘pillars’ of a national integrity system – accountability, culture and system. Strategy: A strategy for strengthening integrity is put in place. 6.1 Improve the quality of your civil service cadre. Although civil service reform is partly under national control (e.g. for general terms and conditions, salary scales, senior promotions), there are still many things that you can do to improve things within your sector or in your area of responsibility. You are likely to have significant control over recruitment, over promotion, over sanctions and discipline of your officials. You may be able to make larger changes, such as ensuring that the exams used to control entry are properly reviewed and marked. Recent evidence supports how important strong control of the exam system is (e.g. Oliveros and Schuster 2018). Working hard to ensure fairness in these areas within your responsibility is a prime example of integrity management. Staff respond positively and are then less ready to engage in corrupt practices. Your strategy is to move your public officials from being part of the problem to be an essential part of the solution. 6.2 Consider how the national religious authorities can have a useful impact. Religious authorities may already be deeply engaged on integrity and anti-corruption in the country, but often are not. There may well be scope to bring them in. This may be true sector by sector, as well as nationally. For example, in the defence sector in Norway, it is the Lutheran military pastors who are responsible for ethics and integrity in the Norwegian military. 6.3 Establish a small Integrity Unit or a Transparency Unit within your Ministry/organisation. Having people in place full-time to advocate and/or coordinate change can make all the difference. Think how you can do this in your Ministry/organisation. Such units have had significant impact in many different environments (e.g. defence sector in Poland See Wnuk (2008), pp29-30; or Pyman (2017) Addressing Corruption in Military Institutions p520; nation-wide in Colombia described in OECD (2017), health sector in Afghanistan (See Pyman 2018) , even when they have only 2-5 staff, such as in Poland. 6.4. Set up an ad-hoc ‘Integrity Committee’ or ‘Integrity Advisory Group’ in your Ministry. This would be a way of marking the importance that you place on ‘integrity’ in the Ministry/organisation. Such Committees are becoming more common at national level: for example, there is a National Moralisation Commission’ in Colombia (See OECD 2017 Integrity Review of Colombia).It might not work, or it might just become a talking shop: in which case, abolish it again. On the other hand, you might be able to use such a group to change peoples’ perceptions of the importance of building integrity and using pride in these values to tackle corruption. 6.5 Set out an ‘Integrity Framework’ for your Ministry/organisation. You could gather together a group to design a specific integrity strategy and call it an ‘integrity framework’ for your Ministry/organisation. 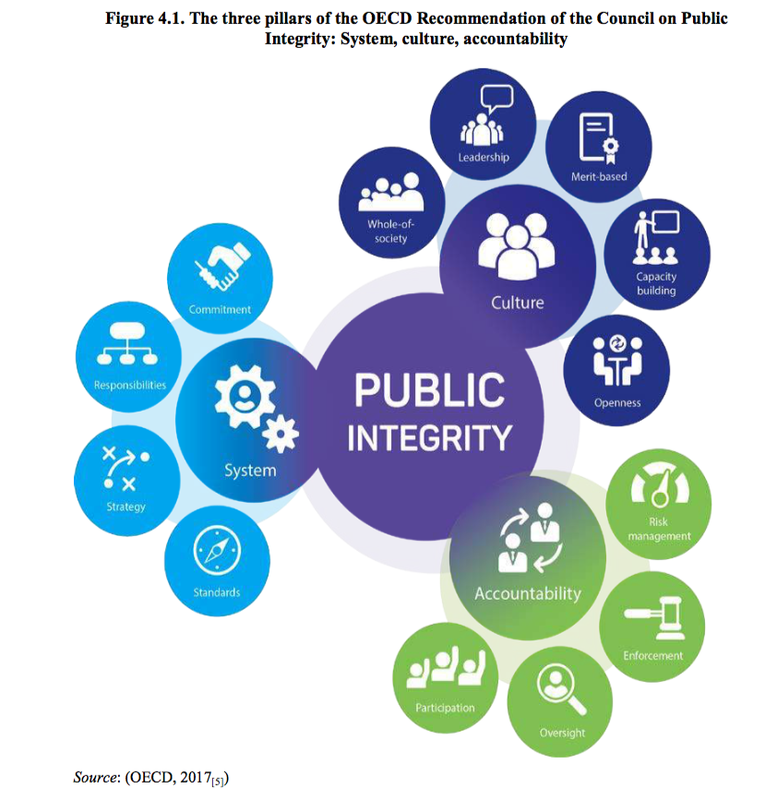 The OECD is increasingly active in working with countries to structure suitable integrity frameworks for the nation’s public officials. Besides Colombia, already mentioned, this has also included Mexico (OECD 2017 Integrity review of Mexico: taking a stronger stance against corruption), Thailand (OECD 2018 Integrity review of Thailand: Towards coherent and effective integrity policies) and Kazakhstan (OECD 2017 Integrity scan of Kazakhstan: preventing corruption for a more competitive economy) any of which you could use for guidance. 6.6 Train your leadership team in integrity and anti-corruption. People in senior positions often need help in how to communicate values. You could set up periodic round tables with your senior colleagues to discuss integrity issues and communicating the values. If you think training would help, there are many people and consultancies that can provide this sort of training. This approach doesn’t work so easily if the senior leaders are all either corrupt or insincere. But, even then, I have seen how such training nonetheless makes a difference, for example in training 1200 senior military and security officers in Ukraine before the Maidan revolution of 2013, and how it can help to change the behaviour of leaders who are known to have been involved in corruption. See Pyman 2017 Addressing Corruption in Military Institutions, section on Ukraine pp523-524. 6.7 Conduct ethics/integrity surveys of staff and use the results. Many governments nowadays conduct annual surveys of its public officials. They can be an excellent way to add ethics/integrity questions (if not already there), to give feedback to staff on the results and the changes you will be making. You may already have a sectoral survey of staff; in which case you can add questions. Even traditionally closed organisations like Defence Ministries have started this: see for example a discussion of a major US Department of Defense 2010 survey (See GAO 2015). More recently, the Netherlands government has initiated reviews of staff performance assessments as a way of monitoring integrity in their public officials (Lamboo et al 2016). 6.8 Consider radical change to personnel to raise integrity. Sometimes the better solution has been to dismiss a whole cadre of corrupt officials and to hire new officials, such as happened in Georgia and Estonia, and in the traffic police in Pakistan. Or to dramatically restrict the mandate of the whole organisation, such as happened with the High Office of Oversight and Anti-Corruption in Afghanistan (HOOAC), and to start anew. 6.9 Initiate or extend integrity/anti-corruption awareness raising and training. You can consider general anti-corruption education for officials; anti-corruption education for young people in schools and universities and building the capability of locally accountable community oversight bodies. Such development programmes can be a useful measure, especially if they reach a critical mass of people or officials, and in environments where it is hard or dangerous to have more direct impacts. This is one way to show that at least something is happening, however modest, especially in highly corrupt environments. But, be careful how you do this: research suggests that awareness raising can also unintentionally backfire, reducing confidence. There is now some guidance from this research about the sorts of messages to give out. In brief, don’t put out multiple different messages, do stress the successes so far against corruption, and do not make the issue look overly complex (For more, see Peiffer 2017a, 2017b). 6.10 Introduce integrity into your community via social media. The NGO Accountability Lab supports change-makers to develop and implement positive ideas for integrity in their communities, unleashing positive social and economic change. They have developed many ideas, such as the TV programme ‘Integrity Idol’, designed to ‘name and fame’ citizens demonstrating integrity, instead of name and shame. It is a new initiative, just four years old, but is now active in 5 countries (Liberia, Mali, Nepal, Nigeria, Pakistan). 6.11 Initiate long-term societal change through education. There is evidence showing that one of the important factors in reducing corruption for the Western nations and for Uruguay was through universal education ( Uslaner 2017, Uslaner and Rothstein 2012). The impact of universal school education has also been argued as one of the drivers of the more recent reductions in corruption in South Korea. See Mungiu-Pippidi and Johnston 2017 p218). Other relevant elements of education in the progress against corruption include the education of elites abroad (as in successful countries like Botswana, Chile, Georgia, South Korea), the role of universities as islands of resistance to corruption (as in Estonia, Georgia). (Mungiu-Pippidi and Johnston 2017 p238). However, the research shows that universal education is only effective if in concert with other approaches; of itself it is not sufficient, as in the less positive experiences of Greece and Italy. See OECD 2017 Educating for integrity: teaching on anti-corruption, values and the rule of law. Finally, ‘power from within’ comes from the motivation and agency that gives people their sense of individual self and dignity. A paper by Schweisfurth et al 2016 on developmental leadership in the Philippines reveals how the extracurricular opportunities enjoyed by Filipino leaders during their education helped build their sense of social capital, leadership skills, and motivation for public service. 6.12 Review the effectiveness of Integrity standards and Codes of Conduct and improve them. Codes of conduct and standards are most often in existence, the issue is that they have long not been enforced, and this laxity has become accepted. You can make a step to change this by commissioning a really objective report. It will most probably be highly critical, but that’s the point. It gives you ammunition to push for change and improvement, and this is likely to be supported by staff. Spectacularly critical reports can have an impact, such as one from Wong and Gerras (2015) about falling standards of integrity in the US army. 6.13 Review and call out Conflicts of Interest. Conflict of interest is an important but difficult aspect of integrity. Many people do not recognise what is a conflict of interest or rationalise them away. Making them explicit can help to make real to your staff what these conflicts are, how they can merge into corruption, and how they evidence a lack of integrity in your organisation. An example would be in relation to improving recruitment and promotion practices, where such conflicts are often responsible for non-meritocratic decisions by line managers. 6.14 Ask stakeholders about ‘fairness’ as a basis for solving a corruption issue. Fairness is one of the elements of integrity, and this can be a better lens that ‘reducing corruption’. For example, where you have citizens paying for small services, or stuck in waitlists, and both are subject to corruption by the responsible bureaucrats of officials. Working with citizens on solutions that they regard as ‘fairer’ even if there is still corruption, may be easier. 6.15 Make ‘Building integrity’ one third of your strategy along with ‘fighting corruption’. Building integrity can be more motivating than the more negative reducing corruption, though this varies from society to society. There are pros and cons to this. In some cultures, it really is counter-productive to speak directly about corruption, but this approach can also be used by officials to justify working on ‘easier’ issues, such as training and capacity development, rather than actually tackling the tougher sides of the problems. Both civil society and media are seen to be important to reducing corruption. In the case of civil society, this has been the orthodox view since it was proclaimed by the World Bank back in 1997. However, civil society projects often have no discernible impact. As recorded by Mungiu-Pippidi in her 2015 book, p174, out of some 471 civil society projects in Eastern Europe in the period 2000-2010, only about a third of these projects had any traceable impact. These projects were the ones that targeted corruption directly and concretely, they were done in collaboration with journalists, and they were set up by grass roots organisations rather than by donors. A similar analysis by the Partnership for Transparency Fund (PTF) of 200 projects that they sponsored came to similar conclusions. Successful projects needed to i) Focus on a single set of problems and not be ambitious; ii) Do not start until you well understand the problem; iii) be non-confrontational and patient; iv) work with key champions of reform within the power structure; and v) seek to reform the official accountability system with the evidence you have gained from the project (Landell Mills (2013) p230-231). Media are clearly important, as the Eastern Europe example quoted above shows. In the case of investigative journalism, their role and value are self-evident. The problem in recent years has been twofold: the increasing antagonism towards them in many countries, and the declining appetite or ability for news corporations to employ them. The lesson is to bring civil society and media on board as collaborators, NOT as after-thoughts or add-ons. You can consider using a civil society organisation to monitor your overall progress. You could create a policy advisory body, or a progress discussion body into which you could bring civil society and media. Economists have long argued that successful implementation of any policy requires that the preferences of all those involved be appropriately aligned with achieving the goals of that scheme. In tackling corruption, for example, experts consider the criminal law measures that can act as incentives not to be corrupt, such as legalisation of payments, reform of public programs or procurement systems or privatisation. See Rose-Ackerman and Palifka (2016), p126. 8.1 Incentive approaches. However, in its application to tackling corruption, the incentive approach has had a mixed reception, as it is often unclear who is the agent and who is the principal. Furthermore, monitoring agent behaviour and holding agents accountable is particularly difficult in the public sector. This has led to other sorts of approaches being preferred, such as ‘collective action’ by all the involved stakeholders. Nonetheless, once we are down at sector level – as opposed to national-level measures like criminal law reform – it becomes easier to see how specific incentives can help to re-align policies so as to promote less corruption. There is also some analysis that is helpful in distinguishing between sectors where it may be easier to improve performance through incentives, and sectors where it will always be difficult. In an analysis by Fukayama 2004 he suggests looking at public sectors on a matrix that plots ‘transaction intensity’ against ‘specificity’. Transaction intensity is a simple concept – it is simply the number of decisions that need to be made by organisations. Thus, for example, a central bank makes very few decisions, such as making changes to interest rates, whilst a health system makes millions of decisions every day. Specificity refers to the ability to monitor a service output. For example, jet engine maintenance is a highly specific service output: it is very hard to fake. By contrast, early years school education classes are very easy to fake and are hard to measure reliably. 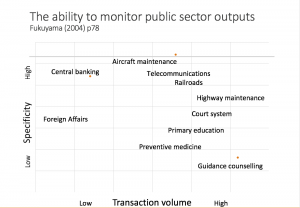 If you set up this matrix of Specificity versus Transaction intensity for public sector services, Fukuyama suggest that it looks like the chart opposite. One current example of the application of incentives to reduce corruption in particular sectors is from the work of Khan et al 2016, 2017 at the School or Oriental and African Studies (SOAS) at the University of London. They have examined in detail mechanisms for reducing corruption in the Bangladesh energy sector, the Bangladesh garments sector, and the Nigerian power sector. Another example is from corruption reduction efforts in the forestry sector, for example in Ecuador, where they combined a new government decree with the ability to monitor logging activities on the basis of verifiable indicators. See Kishor and Damania (2004) Improving governance and reducing corruption in the Forestry Sector. In these cases, the objective of the incentives is not to ‘reduce corruption’, but to make the sector more productive: This is in line with guidance elsewhere in this website that your objective is rarely to ‘reduce corruption’, but more likely to make the sector more productive (See here). 8.2 Other economic approaches. There is a raft of economic measures that have a place in reducing corruption. Examples include more competition, more consumer choice, better information, fewer layers, firm incentives, better banking rules, the role for technology, spillover and demonstration effects, and so on. These measures can all have significant impact on corruption, but there is little written up about their specific anti-corruption impact. If you have examples and reports, do let us know. This is an area where more knowledge of the anti-corruption impact of economic reforms is needed. Policy makers are increasingly using ‘nudges’ as a tool for changing behaviour. Instead of controlling how people behave by taking away their freedom to choose, they are changing the decision-making context in a way that leads people to make different choices, thereby ‘nudging’ them towards a desired behaviour. A ‘nudge’ is a means of encouraging or guiding behaviour, but without mandating or instructing, and ideally without the need for heavy financial incentives or sanctions. We know what it means in everyday life: it’s a gentle hint; a suggestion; a conspicuous glance at a heap of clothes that we’re hoping our kids might clear away. Research in social and cognitive psychology has led to new thinking on how people make decisions. We are not ‘rational choice beings’, as the economists would have it. Rather, we are influenced by our context and our emotions, and our decision-making ability is prone to errors in remembering, predicting and deciding between options. Further, the research has shown that these errors are often not random, but predictable. This in turn has led to a rapidly growing new discipline, called ‘behavioural science’. Amongst the insights are ways in which small changes in people’s decision-making context can have large impacts on behaviour. In the UK, for example, in order to increase savings for retirement, the government has instituted a policy where employers automatically enroll their employees in pension schemes. Employees can opt out of the scheme if they want to – that is, they are under no obligation to remain enrolled. However, simply by making having a pension scheme the ‘default’ option, employers have increased uptake of pension schemes significantly. Nudging is appealing for a number of reasons. First, nudges are often relatively cheap as compared to other policy tools. Changing the default option, for example, may simply entail changing one sentence and one tick box on a form. Relatedly, nudges can be easy to implement. Implementing them often does not require legislative changes or multiple approvals. In contexts where the bureaucratic processes and inefficient governance slow down change, this can be particularly beneficial. Third, nudges may work in contexts where increasing the level of control over people’s behaviour can actually backfire. Higher levels of regulation and monitoring do not necessarily lead to reduced corruption. In fact, restricting people further may signal to them that they are not trustworthy or to make them feel resentful, driving them to behave more unethically. Control and punishment may also reduce people’s internal motivation to act ethically. Finally, the design of nudges is based on an understanding of human psychology. As a result, nudges may be more effective than policies that forget to take the ‘human’ element into consideration. Nudge theory recognises that people are not always rational and that they won’t necessarily act logically, and that information or awareness alone won’t necessarily change behaviour. People do not always carefully weigh up the costs and benefits of acting unethically, factoring in the risk of getting caught and the potential punishment. The theory also accepts that multiple drivers – the physical context, individual psychology, and those around us, to name a few – impact on behaviour. For example, there are many reasons why people may be dishonest or corrupt, such as feeling social pressure to conform, losing self-control due to exhaustion, or a sense that they deserve the spoils of a corrupt behaviour because they are being treated unfairly. Even well-meaning individuals who are informed about corruption and its consequences may fail to make the right ethical choices sometimes. A nudge-based approach acknowledges these aspects of human psychology and responds to them. Below are examples of nudges that can be used to reduce corruption – either on their own or as applied alongside other more traditional methods. While based on behavioural science research, nudges by their very nature are highly context specific and should be tested when used in new environments and situations. If you want to read more generally about this whole new topic, we recommend the original book on the theory by Thaler and Sunstein (2008) and a book about its application in political practice in the UK by Halpern (2015). 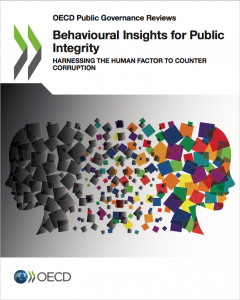 The application to tackling corruption is well covered in the new publication from the OECD (2018). Research has shown that people are more likely to be ethical when doing an activity if they ‘pre-commit’ to behaving ethically before starting that activity. For instance, documents that ask people to sign an ethical statement committing themselves to truthfulness, usually have that statement at their end – the individual only signs it after having filled out the rest of the document. However, research has shown that people are more likely to be honest in filling out forms if they sign such statement at the beginning of the document, before filling in the rest of the form. Example: To reduce fraud in filling out expense reimbursement forms, for example, you can ask individuals to sign their name next to an ethical statement at the top of the form. You can even ask people to manually write out ethical statement, such as: “The information I fill out below will be an honest account of the truth,” at the top of the forms. Public commitments have been shown to be very powerful in driving behaviour. One way to increase honesty is to have individuals verbally or in writing (and ideally both) to commit to integrity in front of colleagues or the public. Such commitments work through at least two mechanisms. First, people tend to want to act consistently for their own sake, to promote a clear narrative of who they are – if they say they are honest, then they are more likely to want to act like an honest person. Second, people want to act consistently in front of others due to social pressure – if they say they are going to act with integrity in front of their colleagues, they may be embarrassed to then not act with integrity in front of those colleagues. Example: When new employees first join your organisation, as part of their induction, in an all staff meeting you can ask that when they introduce themselves to everyone in a staff meeting that they also make a verbal commitment to acting with integrity. Another idea would be to give out pins with the words “I act with integrity” to staff. Wearing these pins would be a self-declaration and also a moral reminder to others about the need to act with integrity. People are more likely to be dishonest by omission rather than commission. That is, they are more likely to leave out information that results in them being dishonest than to actively provide false information -it is simply easier to feel like an ethical person when omitting to admit to something. Example: This insight can be used by getting people to actively declare that they do not have information to provide. For instance, you can ask people to fill out nil tax returns, where they need to submit a return even if they have had no earnings in the previous year. Or this can be applied to people receiving public assistance. Instead of expecting recipients to actively declare a change in their circumstances which might reduce their assistance if and when such changes occur, you could ask them annually to state that their circumstances have not changed. Sometimes people simply need to be reminded to act ethically. This is in part because everyone has a limited amount of self-control (or willpower). During stressful periods, when time and resources are short, self-control is diminished, and people are much more likely to succumb to temptation. Sending people reminders about ethics during at-risk procedures can lead them to act more ethically. Having a step by step plan, even for an ‘easy’ activity, significantly increases the chances of the activity getting done. For example, people have shown to be more likely to go to a polling station and vote if they think through a specific plan as to how they will get to the polling station on the day – they may decide on what time they will leave work, what mode of transportation they will take and whether they will take their children with them. A more specific type of planning method involves making “if… then…” plans. Making concrete “if… then” plans has been repeatedly shown to increase people’s chances of achieving their goals by helping them get past foreseeable obstacles or challenges. In this method, when individuals have a goal, they identify the key obstacles to achieving this goal, as well as ways for addressing these obstacles. If these obstacles arise, then they have a plan as to how to get around them. Individuals working in setting where there is a high chance of being tempted to act in a corrupt manner could devise if-then plans for high risk situations. Example: If the objective is to manage a fair, ethical procurement process for a government contract, an official may make a plan that includes ‘being offered a bribe by a bidder’ as an obstacle. The plan could then include a strategy such as: “If I am offered a bride by a bidder, then I will refuse it and report the incident to my supervisor.” While this may seem simple, it can be a highly effective way to ensure that in a stressful moment, or when willpower is depleted, the official does not cave into temptation. We are social creatures, and those around us have a huge impact on how we behave. What others do gives us information about what might be best for us, and peer pressure leads us to want to conform to what we believe others think we should be doing. Social norms are the common ways of behaving within a particular social group, and most people try to conform to such norms. Example: When there is a high, but imperfect, adherence to a desired social norm, advertising this high level of adherence can lead those who are non-compliant to change their behaviour. For instance, if you know that 92% of staff in the ministry truthfully declared X in the previous year, you can send a letter or email to all staff informing them that 92% of ministry officials did X. The desired behaviour can be reinforced by rewarding commitment to the norm through public recognition. For example, every month you can email all staff in the ministry a list of all the individuals who did X. Even direct, personalised and non-public recognition can be effective in promoting a desired behaviour. Individuals could receive a thank you email from the CEO thanking them for their commitment. There is an important point to be made about advertising imperfect adherence to a desired behaviour – informing people that not everyone is compliant may backfire and lead to further non-compliance. Unfortunately, there is no ‘magic’ threshold level of compliance that guarantees that a behaviour will be viewed as being followed by a sufficient number of people and thus be a norm that most people will want to follow. Each context is different. This is why it is particularly important to test such social norm messages. What is clear in any context, however, is that you need to be very careful about highlighting high levels of corruption, because doing so may actually be promoting a negative norm – making people feel it is common and thus acceptable to act corruptly. When people see that their peers have violated one social norm, they are more likely to violate another. One experiment showed, for example, that when an envelope that clearly contained money was placed halfway in a mailbox, passersby were twice as likely to steal the envelope if there was litter around it than if there was no litter. Littering signalled that people were not complying with one norm – placing rubbish in bins instead of throwing it on the pavement – and led to lowered compliance with another norm – not stealing. To encourage pro-social behaviour in one area, therefore, it is important to demonstrate it in others. And this can be done by ensuring correct behaviour in more observable spheres. Example: To reduce the theft of office supplies or stamp out other forms of petty corruption in your office, it might be useful to ensure that pro-social norms within your office are followed. For example, you might want to make sure that your organisation’s offices are clean and tidy, making it clear that leaving a mess is not accepted. Enforcing rules that are easier to ‘see’ and enforce than many forms of corruption can actually lead to a reduction in corruption itself. People tend to overweight small probabilities. That is, they perceive a small probability of something happening as being much greater than it is. Example: When resources are very limited to carry out audits are very limited, you can alert people that anyone could be audited, but that only randomly selected individuals or organisations will be. The chance of being monitored, even if very small, may act as a large deterrent. Simply having theses of being watched makes people more honest. Experiments have shown that placing pictures of two eyes over ‘honesty jars’ that people put money into to pay for a snack, tea or other items has been shown to increase the amount of money people pay. This simple method can be used in many situations where enforcing a rule is either not possible or not advisable. Example: Pictures of eyes can be hung up in civil servants’ offices, facing their desks, so that when they are meeting with constituents within the confines of their offices they feel like they are being watched. Multiple randomised control trials have been done to test the best way to get people to pay their taxes. The experiments involved sending people different types of letters, which frame the request for payment in various ways and checking which type of letter, on average, led to the greatest number and highest value of tax payments. The results varied from country to country, demonstrating the need for testing, but the trials offer examples of the types of frames to test. Example: It is possible to experiment with various types of letters or emails to elicit compliance with diverse regulations, not only tax compliance. A nearly identical letter can have small variations to test which type of framing is most effective. One letter can simply ask for compliance. The second can use a social norms nudge, informing people that a high percentage of their fellow citizens have complied, A third can threaten sanctions and a fourth can remind the individual of the ethical reasons for compliance. Personalised messages are often more effective in eliciting action than non-personalised messages. This is why marketers use recipients’ names in emails whenever they can. Despite people knowing that they are receiving a mass-generated email that has gone out to thousands of people, personalisation makes us pause slightly longer when we see the message, increasing the chances of us reading the rest of the email and paying more attention to the content. Example: When sending out mass communication to households, for example, in order to encourage more ethical behaviour, you can personalise the messages, ideally with the recipients’ first names. Scarcity of time and money leads to reduced self-control. For individuals who only rarely act unethically, these moments may be when they are most likely to succumb to temptation and make a decision that is self-serving at the expense of integrity. As a result, major decisions where corruption is possible should be made when decision-makers are least likely to have reduced self-control. Example: In contexts where civil servants are paid little, they might start having financial worries in the days before getting their monthly wage. This is a period of scarcity and risk to their self-control. As such, you should schedule the times for final evaluations of bids and the announcement of tender outcomes for when the decision-makers involved are most likely to have more money – such as a few days after they get paid. This may reduce the decision-makers’ inclination to change the bid scores in a way that results in the winning bidder being chosen based on bribes or other improper influence instead of on merit. (editors) Alloa, Emmanual and Thoma, Dieter (2018) Transparency, Society and Subjectivity:Critical Perspectives. Palgrave MacMillan. Balan, Manuel (2018) What to make of Latin America’s wave of anti-corruption prosecutions? GAB blog, September 6, 2018. Bennett, Helena and Pyman, Mark (2018) Corruption in Iran. Experience, perception and reform efforts – a literature review. Institute for Statecraft. Hunt, Jenifer and Phillips, Sarah (2017) Becoming a ‘Positive Outlier’: A Case Study of Oman. Developmental Leadership Program, Research Paper 47. OECD (2017) Preventing policy capture. Integrity in public decision making. 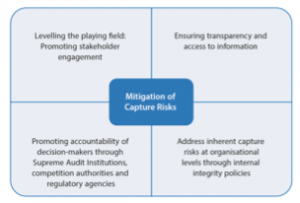 https://read.oecd-ilibrary.org/governance/preventing-policy-capture_9789264065239-en#page4. Peiffer, Caryn (2017a) Getting the message: Examining the intended – and unintended – impacts of corruption awareness-raising.Development Leadership Program (DLP), Research Report 49. Peiffer, Caryn (2017b) Message received? How messages about corruption shape perceptions.Development Leadership Program (DLP), Research Report 46. [i] In academic writing and research, you will find that this effect of peoples’ actions is rather clumsily called ‘Human agency’. It is used by sociologists to describe the capacity of a human being to act and to effect change personally, arising out of their individual behaviour. It is in contrast to change happening due to social ‘structures’, by which sociologists mean the circumstances that the individual finds themselves in, such as social class, religion, gender, ethnicity, subculture, etc., which seem to limit or influence the opportunities that individuals have.